How cute you look in that last picture Kitty! Those pudding cups are awesome, and I am going to make them once Xavier is older. Happy Halloween! Love that costume! Looks like you're all ready for Halloween! What a cute kittle baker; love those dimples! You two certainly are having fun in the kitchen. Cissy is so blessed to have you in her life and all the memories you are making with her will stay in her heart forever. You look cute in your blue bonnet by the way. Hi Kitty, oh so much fun you and Cissy have in your kitchen baking! I love these pudding cups. Thanks for sharing this at C&C with J&J. Wishing you a Happy Halloween. 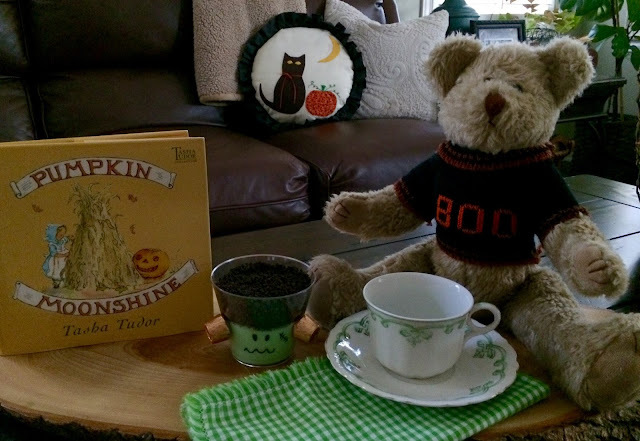 Your photo is great,such fun!Congrats to Cissy,fabulous puddings,so cute!Happy Halloween! Bwahahaha! Your Halloween costume made me laugh out loud. I love this post for so many reasons: the Ghostbuster dog, cute Halloween decor, creative dessert and your sweet grandaughter. 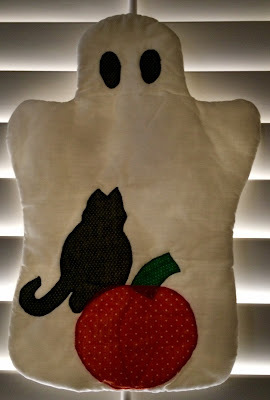 Happy Halloween, Kitty! Oh my! Those pudding cups made me laugh out loud! TOO ADORABLE!! Very creative and fun. Love all your sweet and sentimental decorations...very fun for both of you. Your costume!!!!!!! That is one of the funniest I’ve ever seen!!! It took me a minute to figure out how it worked. I’m slow like that!😉 Such cute pudding cups for Miss Cindy and crew. They will no doubt enjoy those!!! I love the Frankenstein pudding cups!! They are so clever, and they sound yummy, too. :D The bear is so cute in his "Boo" sweater, and your pillow and ghost are adorable. Cissy sure is a cutie! I love the Ghostbusters song -- it's a great one to dance to. Thanks so much for your visit and sweet comments, Kitty, and Happy Halloween to you! What a cute post. The Frankenstein pudding cups look so fun and I’m sure delicious. Cissy’s bright smile is always a joy and you can see she is so proud to share these goodies with her family. 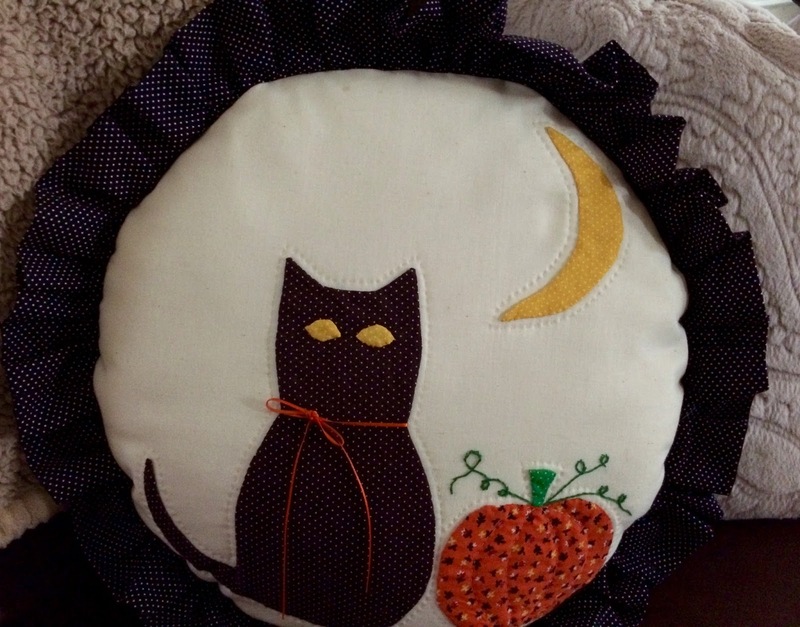 Love the darling pillow you made from the hoop art. Yes, I remember them and had fun creating these too. Love your Boo bear and the sweet ghost you created but that last pic is a hoot. LOVE it. Looks like you and your friend were having lots of fun. Great costume. Have a nice evening and lets hope it doesn’t rain like they predict. Not until I give out all the candy anyway. HAHA!! Oh Kitty, that costume is hysterical! I had to look and look again to figure our which part was you...LOL! Super creative. I've never seen a costume like yours. I think I have it figured out. Sissy and you have too much fun. She is s cutie. Yes, it was cold here this morning but got up to 77 in the mid afternoon. You are all having way too much fun! That costume is amazing! And the cups are so fun. Thanks so much for linking to Tuesday Cuppa Tea. I tell ya - that sweet grand Cissy is slowly becoming just like her Grandma! She really is something else, that one! 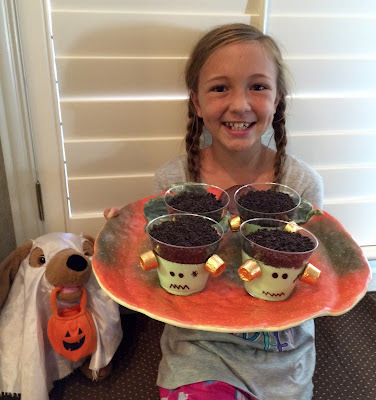 The Frankie cups look perfect- her sibs must love those treats coming home with her! I about spilled my coffee seeing that pic of you in that hilarious costume, haha - so adorable - thanks for the smiles. And those Frankenstein cups are just the cutest! What fun you and Cissy must have together. Such special times for you to hold close to your heart. Oh, how cute! Just adorable. :) Praying for you, sweet friend. That smile on Cissy's face melts my heart, what a joy for you! 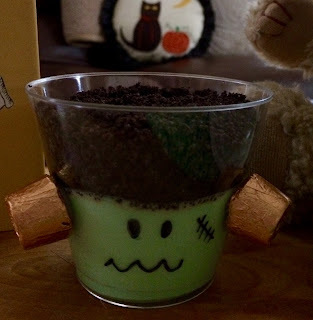 Those Frankenstein puddings are just the cutest ever! So clever!! Happy times!! Oh, how fun your costume is, Kitty. It did make me giggle. Those Frankenstein puddings are fabulous. How simply adorable are these!!!??? But I have to say that your costume tops the pudding cups on the cuteness scale!! Hi Kitty, Cissy is so creative. The Frankie Pudding cups are the cutest! Ii bet the siblings loved them. How cute are the costumes. Looks like a great halloween. Such special times for you and Cissy to share together! I do remember those wooden hoops, I had to "rescue" some pieces that I cross-stitched out of them some years ago, lol! Enjoy the cool Texas weather :) We are getting a dump of snow here today! Kitty, you look adorable!!! You are right sweater weather has arrived for a little while anyway. Cissy's Pudding Cups are just the cutest things ever. Thanks so much for sharing your special post with us at Full Plate Thursday. Have a great weekend and come back to see us real soon! A fun and fantastic post. I don't need to ask if you've enjoyed the holiday. You come up with the most clever ideas for Cissy to make. i'm a new follower, can you follow mine on my blog? Kitty, that last picture made me laugh! The Frankenstein cups are so fun and I love the things you made. Thanks for sharing with SYC. Wow - now that's what I'd call a "costume"! You should get a prize for wearing that Kitty! Thanks for sharing that sweet Cissy again! Cute! love spells to attract love Valuable info. Lucky me I found your website by accident. I bookmarked it. This article is genuinely good and I have learned lot of things from it concerning blogging. thanks.